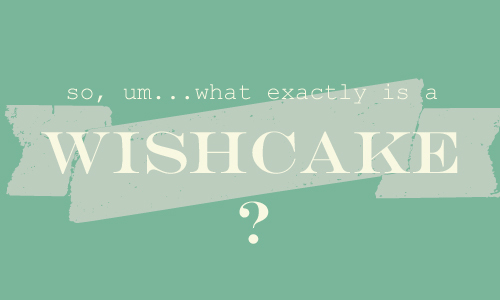 Throughout this whole blogging experience, I've had many people ask me where the name "wishcake" came from. I'm not sure why I haven't sat down to write about how I came up with it, especially because if I were in your shoes I'd probably be confused beyond all reason, too. What the heck does this girl do, anyway? Make baked goods? Grant wishes? Grant wishes involving baked goods? SERIOUSLY. I DON'T GET IT. 1. My name, because even then I was afraid of being murdered by someone on the internet. 2. A word that I love but has already been taken and has to be followed by a combination of sixteen numbers, because I'm entirely too OCD to deal with that mess. 3. Something that would make me sound emo. 4. Anything involving my slowly waning obsession with boy bands, even though I'm pretty sure I was wearing my old Hanson t-shirt at the time. As I'm sure we've determined by now, I'm really picky and kind of judgemental about things. Things that don't even really matter. (Like the layout of bookshelves, people who can't sing "happy birthday" on key, the kind of cheese that is acceptable on a grilled cheese sandwich, etc.) Needless to say, coming up with a good screen name was very important. I went through a million word combinations and at some point I guess it just clicked. Wishcake. It just worked. It fit. It was random, quirky and something that I was sure nobody else had thought of. Granted, when I told my dad my new screen name he was all, "Um, if you're hungry we can make you a sandwich, you know." And whenever I had to give out my email to the American Eagle employees while buying something, they'd look at me like, "What? Who are you?" and I'd be all, "Yeah, I don't even know." In hindsight, I am glad I somehow managed to come up with that random combination of words that would end up meaning a lot more to me down the road. However, surprisingly enough, this blog didn't even start out having anything to do with the word that seems to identify me around this ol' blogosphere. Since I'm here explaining the whole name thing, I figure I could give you a tiny history of this blog (I know, I'm boring myself right now - it's okay if you want to go finish off that half-pound of fudge you have sitting on your counter; I don't judge). I just know that I've always been interested about how people started out and what inspired them to continue with blogging, so I figure there may be someone out there who is curious about my story. When I started out this blog in April of 2006 it was called "Simply, me." I didn't have a fancy layout. I didn't have any readers. I wasn't writing for any sort of audience and pretty much just wrote for myself, hence the reason the language wasn't perfect - or the grammar. I didn't update that often. (In fact, if you ever feel the need to dive into the archives it's pretty much just me whining about stuff and wanting a cat. You know, the usual.) I didn't intend to keep this blog around, actually, and had another private online journal somewhere else at the time that I used more often. I didn't even realize there was this whole other bloggy world out there, aside from the basic Livejournal type of thing. The only reason I started a public blog was a direct result of being inspired by the first blogs I kept track of on a weekly basis (and developed some serious blog crushes on in the process): Whoorl and Love is Blonde. I wrote and wrote. Mostly for myself. Which I'm thankful for, because I think that when you blog without an audience it's a whole different thing. Your writing is much more pure, in a way, because you aren't worried about what people will think or how it will come across. I'm glad I had a while to grow and develop myself as a blogger, if that makes any sense. Then, after a while, I told a couple friends about my blog. And then a few other people I didn't know started reading. I started reading other blogs and before I knew it, I realized I was a part of a community I had no idea would be so amazing, supportive and inspiring. When I started writing here, I had no idea that it would end up being such a huge part of my life. It was a very slow progression when it came to developing a readership and discovering all these new friendships along the way. Last year, I decided to buy my own domain and ended up using "your wishcake" as an official blog title. Because, well, if I'm anyone's wishcake, I'm probably yours. Oh, there she goes with the cheesiness. Typical wishcake! Soon she'll be overusing the word "shenanigans" and calling people peaches! The rest is history, I suppose. I can say with all honesty that it's because of this blog and because of the people I've met through this blog that I was brave enough to start selling my crafts. That I developed a love for photography. That I started thinking of myself as a writer and not just a blogger. That I realized I'm braver than I give myself credit for. That I've found the confidence to accept all the wonderful and crazy bits and pieces of who I am. In the last three years I've gone from a girl who would rant to an empty room about her leaky apartment and newlywed life, to a girl who learned to be brave and share her heart with complete strangers, to a slightly more mature girl who is truly finding her voice and is discovering what life can be when you stop giving yourself limits. "Sometimes it's the smallest decisions that can pretty much change your life forever." So, that's the story of "wishcake". And, for the record, I don't really know how to make a cake - unless we're talking Duncan Hines cake-mix-in-a-box. So whoever it is that keeps emailing me about making them a wedding cake, I CAN'T DO THAT. This was my first visit to your blog, and it was great to start with the story of wishcake. And I love anyone who loves boy bands, especially Hanson. Lol, saw your tweet about this post and rushed over here to read! Thanks for the explanation, that's very interesting! Wow, you've had a screen name for 9 years? I've had mine for a year, maybe slightly more, lol. I know what you mean about people encouraging you - I started blogging and getting into photographer because of bloggers and flickr. The internet is an amazing place sometimes. I love the "When I'm bored I make graphics" tag for this, and the story is very sweet! It's the funniest thing, how these names and blogs come about. And I'm a strong believer that if I had any sense I wouldn't use my name either. So I'm glad that at least makes one of us. Seriously, could you be any cuter? I just...don't think it's possible. Props to the younger you for coming up with a creative & unique name that would be popular by now! Also I'm surprised at how people can keep the same name for so long because I always got sick of mine & changed mine 58,974 times! Love this, of course. And your quirky name to match your quirky self. Thanks for being consistently inspirational. As much as this blog has given you, I hope you see that it's giving to others, as well! I love this story of how wishcake came to be. I always enjoy reading stories of what inspired people to start blogging and why they've continued. Thanks for sharing yours. So my first inclination was to say "I'd eat your wishcake any day!" But then I realized that sounded horribly wrong. So no.. But why do I remember having a random conversation about a wand? Yes? No? I've always wondered about this! Good to know! Cute story too. Do people really think you make cakes because that's kind of hilarious. And whenever I had to give out my email to the American Eagle employees while buying something, they'd look at me like, "What? Who are you?" and I'd be all, "Yeah, I don't even know." Best line in this ENTIRE post. I pretty much had the shamey face whenever anyone wanted my email as well. Good to know where wishcake came from. I have wondered about that as much as the others have. I love reading stories of how blog names and screen names came about. Wishcake is such a cute name - I'm actually surprised that it seems to have been kind of random. But it's still one of my favorites. I'm new to your blog but already I love it. You're pretty much adorable and that post was so sweet and inspiring. I'll definetely be back for more! I've always wondered about your name too! :) Love your blog even more since you quoted Felicity at the end! The Happy Birthday song is an IMPOSSIBLY DIFFICULT TUNE! Can ANYONE sing it on key?! I mean, REALLY?! I think it was written to be sung off tune. I love Felicity. She taught me that Glandular Fever is called Mono in America. I think 'wishcake' is lovely. And it totally suits you. You know..what I know of you through blog-stalking and stuff.. ahem. OH, and I am a huge Felicity fan. After every episode I would analyze it for the entire week until it was on again. I could watch everyday. I feel like it was a little secret because so many people DIDN'T watch! I think it suits your blog perfectly. It's quirky and fun and cute! I logged onto Twitter this morning to catch up on all the late night postings (since I have the sleep habits of a 90 year-old granny) & saw your tweet. I sware it felt like I had solved the Davinci Code! The origin of wishcake- hold me! Loved hearing your story. You were actually one of the key bloggers that inspired me. If about 6 months ago you noticed in Google Analytics that someone in Virginia was creeping through all your archives. Ding, ding, ding! That would be me- I have no shame. I love "your wishcake"! You are one of my first inspiration blogs and your name had me at hello. I win with the cheesiness. Hehe. KEE-YUTE new header and pic! Oh PS: You should totally bookmark this post in the sidebar (like with the other "getting to know me" posts) because I guarantee other people will be searching for it in the future! Kudos to you for finding such a unique name for your blog... I definitely know what it's like to spend HOURS trying to find a catchy name that is not already taken! I came up with the e-mail address "picaela" (my name is Micaela) when I was a young teenager and still use it and love it to this day! I have a more mature one (first initial, last name) but I only use it for work related purposes. My only thing is that it's a hotmail address, and still wonder if "micaela" was available back then. micaela@hotmail.com would have been the most amazing e-mail address for me, ever. Awe. I loved this post! I love hearing people's stories. And you are totally not boring! I find you quite interesting! =) This kind of post gives me inspiration. I love this post! There is something magically charming about the word wishcake that describes you perfectly. I've been reading your last few blogs but without knowing how you started.. sweet background update! I am at the point where I don't have a lot of readers and am just foraging into new blogger territory, thanks for giving me a little insight to my future. Just discovered your blog on 20SB! This post was extremely well-written and spoke to me, as I've been going through a lot of the same things. This sentence in particular sang to me: It's kind of amazing when you stop to think about all the tiny, seemingly insignificant choices you make that end up carrying you through your life to a place you never figured you'd be. I've been through a lot this year. I moved to New York City and broke up with my boyfriend and was unemployed and then got a job and blablabla... I know *exactly what you mean about the "insignificant choices" we make. I would love for you to read my blog and tell me what you think. I'm always amazed at the support I find among my fellow bloggers, and also how great it is to find people going through and learning similar things. It's so funny you wrote about this topic, because I was thinking about asking you how you came up with it! I think the name WishCake is absolutley divine! Your blog showcases your writing talent beautifully, and you are a true sweet heart for sharing your thoughts and quirky moments with us. I can't wait to see what lays ahead for our Wishcake, the possibilities are endless!! You make me want to start blogging again. MISS YOU! You were my very first blog friend. :) That makes me happy. I also did not know your real name for at least a year. I loved the history behind Wishcake!!! Very cute name. Love it. And super awesome that you've stuck with it for so long! Your blog makes me smile so much. You have such a talent in writing and the way you can make your ordinary and extraordinary experiences and feelings so relatable. Thanks for all of the effort you put into it. What a readership you've earned! Holy mother, the comments! I had to scroll for a year to get to this box! Bless you for writing this and clearing the air for everyone who wasn't involved in that conversation we all had at the coffee shop back in July. You explained it perfectly! I will probably never have the guts to share the meaning behind Mrs. Priss (yes, there actually is one that goes beyond the obvious) because it involves showing an old home video of 5 year old me in a bright red negligee I found in my grandma's closet. Let's not. "Typical Wishcake!" I love you so! thanks for sharing your history. so cool that you've come so far and grown so much. sometimes i feel silly when i try to explain to my "real life friends" why i enjoy blogging, but if you've never done it, you just can't understand. the blog world is such a wonderful affirming place, where i've met so many great people, who have boosted my confidence and made me feel like i can be brave and try new things. i think maybe it's because we don't know each other that we are able to connect on a pure level. maybe this sounds silly and it may not make sense, so sorry if that's the case. i just wanted to say thanks for sharing this and for sharing your heart with us all on this lovely blog of yours. O. M. G. I hear SO few people reference Felicity. I LOVE that show and remember how I never missed an episode. Now I have all 4 seasons on DVD and watch it once a year. I LOVE the writing in it. It's always nice to find someone else who knows about the show. And I enjoyed reading this post. It's always fun to hear about these kinds of things. i loved reading about the history of your blog. over the months, it truly has become one of my favorites. and is one of the best blogs i discovered this year. Awwww, thanks for this post! I loved reading this history of your blog and how you got to where you are today. this post just makes me all sorts of happy and i love hearing how wishcake began. it's funny because some of my earliest screen names and emails and logins were all really random too and i have no idea where they came from now, but they still hold a special place in my heart and make me all sorts of giddy. Confession: I always thought that wishcake was something I should know about but was too embarassed to ask. (Obviously.) I think it suits you perfectly! I am SO glad you shared this!! I have wondered many a time how you came to "wishcake" and I'm so glad to know now. It's SO perfect for you that I honestly don't know how you could have given yourself or your blog any other name. you are adorable and funny and lovely and make me smile all the time and well, I just LOVE you! Our Wishcake!! OK, I seriously love this and how randomly, wishcake came about. And how you've grown because of sharing yourself with us crazy Internet people. And all that awesome stuff. Nice work, lady! I can't wait to see where this new year takes us all. And I love that you also threw in a Felicity quote! You are an inpiration to me... thank you for writing down your story. I look forward to keeping up with you in the future!